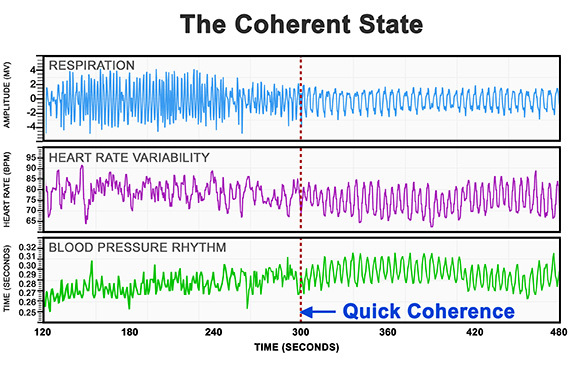 The "coherent state." The diagrams below illustrate the powerful transformation that an attitude of thankfulness has on creating heart coherence, which positively impacts your entire being. Out of the heart flow the issues of life (Prov. 4:23). 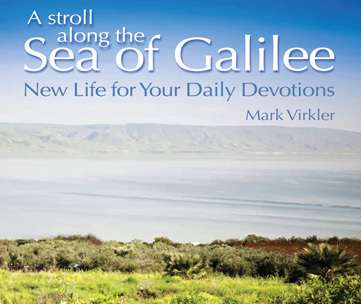 Let God’s peace guard your heart… and be thankful. Scripture tells us to live in a constant heart attitude of thankfulness, gratitude and appreciation! In and for everything give thanks (Eph. 5:20; 1 Thess. 5:18), because God is working all things out for good (Rom. 8:28; Col. 3:15-17). Faith working through love is the central posture of a health-giving heart (Gal. 5:26). Faith and love are mentioned together in 26 New Testament verses! Faith and love shield the heart, and hope safeguards the mind (NEVER meditate on the daily news - Jesus sure didn't). But since we are of the day, let us be sober, having put on the breastplate of faith and love, and as a helmet, the hope of salvation (1 Thess. 5:8). The heart sends more signals to the brain than the brain sends to the heart! Heart signals influence emotional processing as well as attention, perception, memory, and problem-solving. The brain continuously responds to the heart. When the heart rhythm pattern is erratic and disordered, the signals traveling from the heart to the brain inhibits our ability to think clearly, remember, learn, reason, and make effective decisions. We often act impulsively and unwisely under stress. The HeartMath Institute’s research has shown that generating sustained positive emotions facilitates a body-wide shift which is a measurable state. This state is termed "coherence" because it is characterized by increased order and harmony in our minds, emotions and body, producing a state of optimal function. There is increased access to intuition and creativity, cognitive and performance improvements, and favorable changes in hormonal balance. Simply stated, our body and brain work better, we feel better, and we perform better as shown by the chart below. Respiration, heart rate variability, and blood pressure all come into coherence with an appreciative heart! We have all experienced the opposite. When we are fearful or angry, respiration and blood pressure increase. When we are embarrassed, our faces turn read. 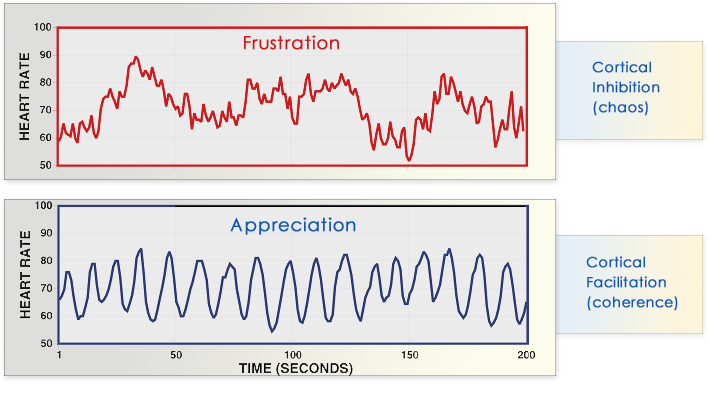 Yes, the emotional state of appreciation effects the health of the entire body. You intentionally generate a heartfelt positive emotional state such as thankfulness or compassion. This emotional shift is a key element of the techniques’ effectiveness and is what brings about coherence. When the heart’s rhythm shifts into coherence as a result of a positive emotional shift, our breathing rhythm automatically synchronizes with the heart. You can mechanically assist step one by focusing your attention in the area of the heart. Imagine your breath is flowing in and out of your heart or chest area, breathing a little slower and deeper than usual (5 seconds on the in-breath and 5 seconds on the out-breath). The chart above shows that respiration does sync naturally to your heart's rhythm as does your blood pressure. I have discovered this kind of breathing helps me fall asleep at night. My experience with heart coherence: I purchased the emWave®2 and use it to help me more consistently maintain heart awareness and an emotion of gratitude. When I quiet myself in the Spirit in preparation to receive or release revelation from God, I enter a state of relaxed peace, and quiet confidence as I acknowledge and turn to the Spirit of God within me. I ask for His manifest presence and breathe Him in with a relaxed smile on my face, acknowledging once again that life is all about Him and not about me. I ask what He wants to speak and tune to flow and receive His pictures, His ideas and His emotions. I then release these, honoring and following the peace which resides in my heart. If I begin to lose that peace, I stop, go back to where I lost it and pick up the flow of the Spirit again. So I am living and walking by the Spirit and I am experiencing peace, flow, creativity, anointing and power. To Purchase - Use this link: emWave®2 (second item on this link) and this coupon code: VAFGET10 and receive 10% off your technology product order PLUS free ground shipping within the continental USA. Journaling from Linda Burton: The human heart was created to be in communion and fellowship with Me. The heart receives love, instruction, positive emotion and relationship with Me. The heart is to communicate this to the brain to tell the body what I desire. This experience is restored to My children and they now have all the benefits and blessings I initially designed for mankind. Keep your eyes focused on Me that you may receive this greatest blessing, heart communion and a restored lifestyle.